The LED does not turn on. The batteries may have ran out. Please use the included screw driver to open the battery case and replace the LR41 batteries. The image is blurred/out of focus. Due to physical limitation, the focusing distance becomes very short when the Magnifying Lens is attached to the P2V. 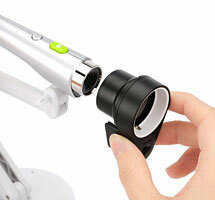 Please place the P2V (with Magnifying Lens) as close to the object as possible for the best result.